As you have may guessed from my past articles, I am a HUGE fan of vintage Ludwig drums with my favorite era being the 1960’s. These are the drums that I grew up around as a child when my dad was a working union drummer in NYC & the surrounding area. This installment of Vintage Happiness is featuring another Ludwig Downbeat set from my collection. This is a 1965 Downbeat set that is finished in Sky Blue Pearl. A fantastic summertime looking drum set. This is a matched set with the build date of June 14 1965 date stamped on the bass drum, tom & floor tom. Sizes of Downbeat sets are 14x20 bass drum, 8x12 tom & 14x14 floor tom. 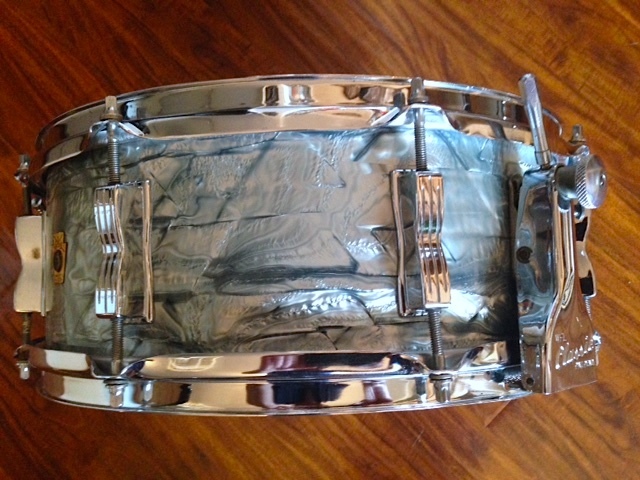 The matching 8 lug Super Classic snare is dated Nov 5 1965. The snare is equipped with the Classic WFL P87 throw off & has an amazingly thick crack & great volume. As with most mid sixties drums the interiors are painted Resocoat white. All the hardware is free of any rust & all white felt P-4067 tone controls are present. This particular set is in overall remarkable shape with barely any fade & the wrap is a vibrant blue in the right light. This is a finish that I really enjoy seeing in the daylight as opposed to in a nightclub gig where the finish sometimes looks like a grey pearl. The bands that I play with book many outdoor summer concerts and this kit is one of my favorites for an outdoor venue not only for it’s remarkable color, but for it’s tonal projection & overall great sound. As I mentioned in my last article, one of the reasons I enjoy gigging with these Downbeat sets are the way they sound: Very BIG for little drums. The shells are the great 60’s 3-ply mahogany/poplar/mahogany combination. Heads on this particular kit are Ludwig medium coated on tom batters & clear on bottoms. Bass drum has Remo Powerstroke 3 on batter with one felt strip. The snare is coated Ludwig Ensemble on batter & Remo thin on snare side. It seems to me that the Downbeat size combination is becoming more of a sought after combination than the Super Classic. However, we must not forget the hybrid Superbeat combination from Ludwig incorporating the best of both worlds with 20/13/16. These sets are becoming more common I have noticed as well. In my personal opinion, they are all fantastic size combinations for these amazing sounding drums from this era of Ludwig. Vintage Ludwig Downbeats are extremely versatile sized drums no matter what the color you end up with. These kits can be tuned for a variety of music and are real easy to travel with logistically. The entire kit fits in the backseat of VW Golf! (with the seats up, NOT down). This set was bought from a fellow local drummer/collector who has been beyond kind to me by passing on a great amount of his amazing collection over the years to me. I will be featuring some of these kits in the months ahead as I have expanded my collection to include more of the great drum manufacturers of the 20th century. Stay tuned..